I walked out on a local lake tonight (pulled a sled about 3/4 mile). The walking was fairly easy. I found that if I stuck to the areas without snow I stayed on top of the slush ice (I’m 230lbs), if I went in the snow it was WET! 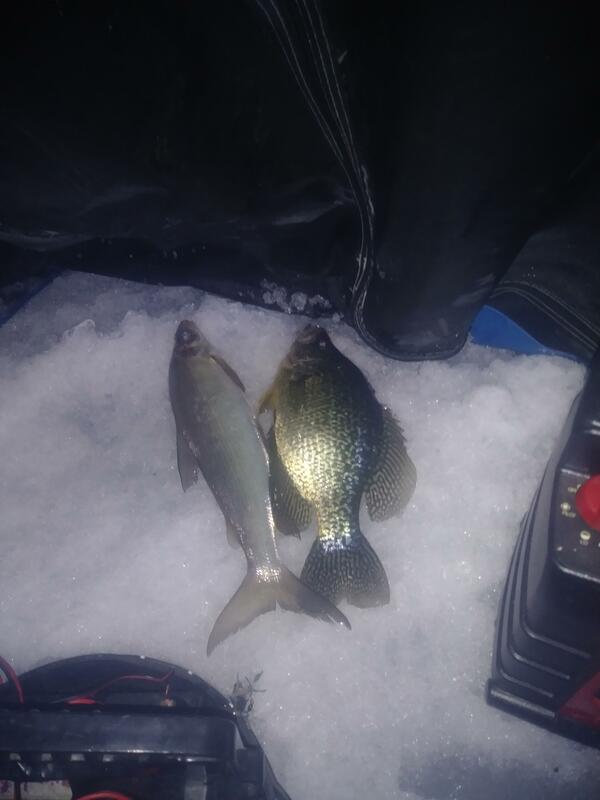 12-14 inches of slush under the snow... fishing was very good I kept 6 crappies and released 20-25. Overall I was pleasantly surprised at the ease of travel. I fished in 12-15 FOW and used a Swedish Pimple with a waxie until 8pm then I switched to a minnow on a red glow jig and caught my bigger fish on the minnows. Was out on a local lake earlier and the travel wasn't bad. Crazy part was once you drilled through the first two inches you hit a pocket of slush then hard ice again. Made for some tough hole drilling. Definitely good ice out there I would guess over 30 inches plus. Fishing wasn't bad we popped some nice crappies and a few decent gills. They are still hanging out in the deeper basins but they are definitely moveing up in the water column. 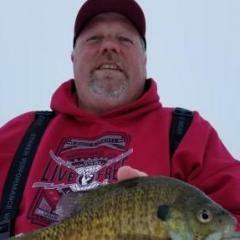 We are heading out again in another hour to chase the crappies again hopeing they crank up good before dark as by the time we located them earlier it was later in the day. 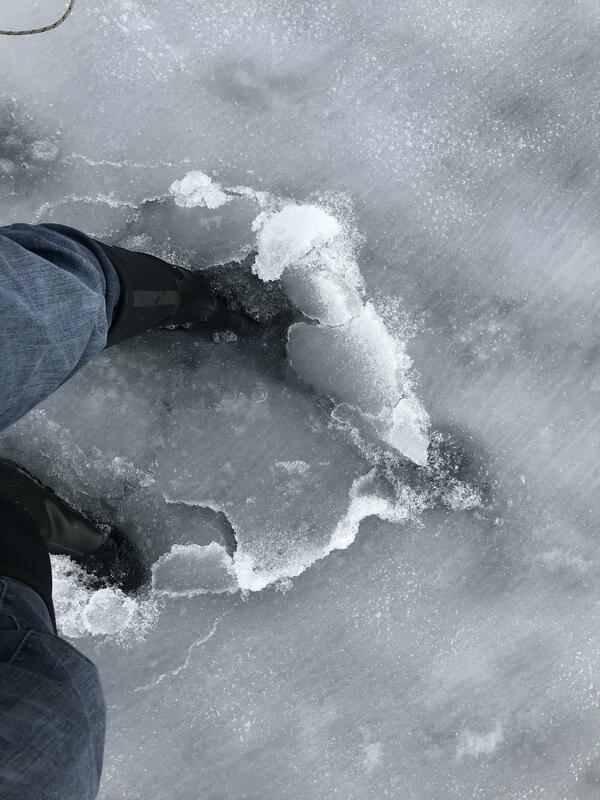 The ice conditions in the Mille Lacs/Aitken area are very similar top what you describe, but wear your cleats. Its easy going, and in most cases you could get around easily with an ATV. I would not recommend any truck or car traffic, as appealing as it looks. That water layer down there a couple inches is really deceptive, and anyplace there was an old plow bank, or significant drift, there I still lots of water under there. I doubt it will get cold enough now to freeze it solid, and to Hawks point, it is really tough drilling, once you hit the water layer and your auger is slush locked, it is slow going.. It's real test. Fishing is good, but its lots of work drilling holes. Be very careful if you have any kind of composite shaft. The tough drilling you guys describe is the same I experienced in ON a couple weeks ago. Except with it being double digits below zero much of the time it meant instant freeze up of the bit on the Ion. You gotta have an aggressive bit in those conditions. 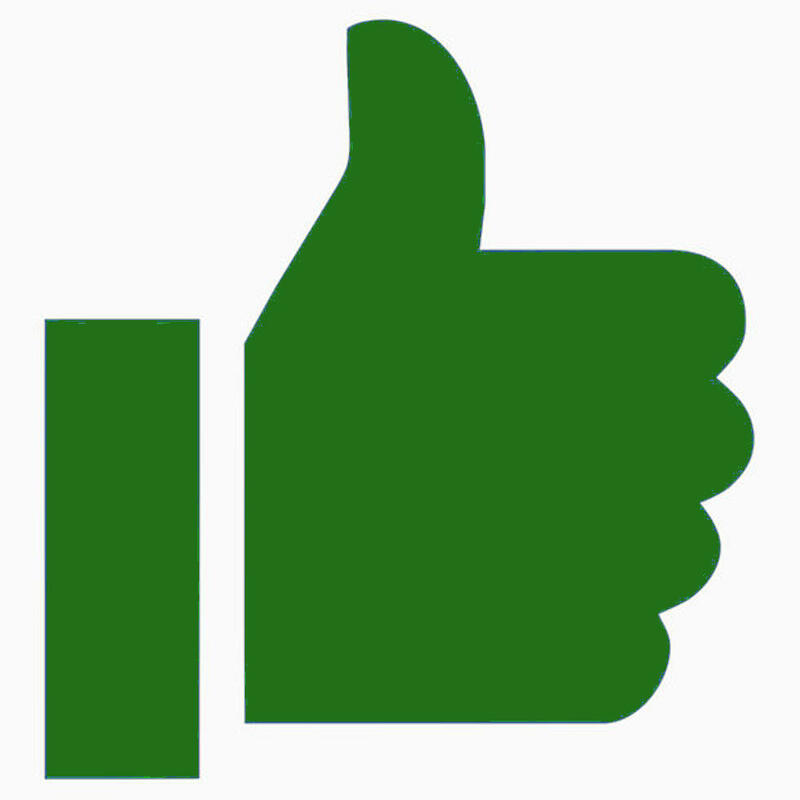 The Nils did much better. I was up on Osakis today and on the north end travel conditions were very good with little to no snow or slush. The access is very rough and slushy though. There's still 35" of good ice. Tons if fish but not a lot of quality to be had. Getting away from the crowds may be a better plan as the north end has been hammered almost exclusively the past month due to all the snow. I would say its over around my area. 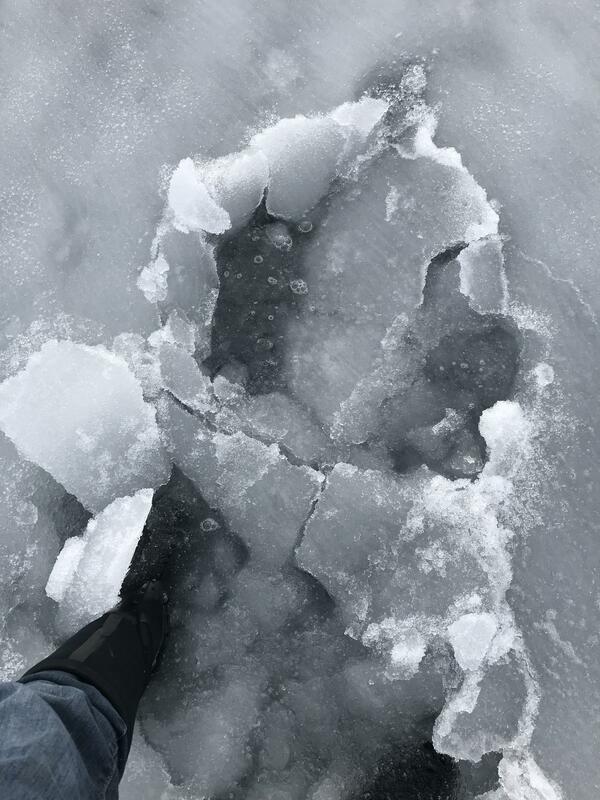 We tried to get on numerous lakes yesterday with hip boots and broke through all the edges. still ice out there once you reach it but Things are going fast. Water is riseing fast. the hwy 22 access is completely flooded and gaining elevation by the minute. Might make a few Northwest runs yet but locally I wont be takeing the risk anymore been a weird year but honestly i'm ready for the long rods to come out! I just drove by the chain and can second that!!!!!!! in cold spring there was a sheriffs deputy and a cold spring officer on the old railroad bridge. the deputy looked like he had some type of gadget in his hand. water was really pouring over that dam. with the news that Antons got evacuated last nite with a full house i'm sure everyones on full flood alert!!! Yah the Dam in cold spring is quite the site I stopped there and looked at it . Its gushing !! Was just out on a small lake near me checking it out. Shoreline ice is deteriorating on the north side otherwise seemed ok... Gonna be hitting a large lake after I eat. 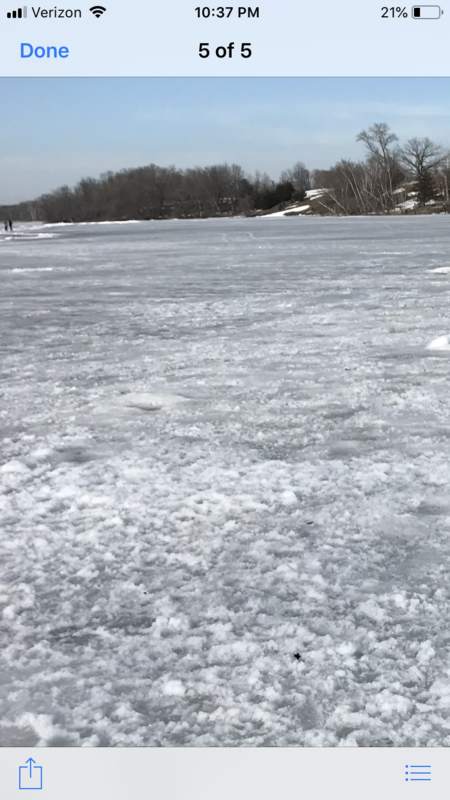 Generally get some big whitefish (even after dark) and a few big crappie out there, thinking about bringing my plank just in case, landing is on the east end so it should be ok.
On a lake by Cold Spring tonight, walking was a little tough. Larger lake had good ice yet. I was actually able to drive off the landing and probably could have drove to my spot but the lake is over 100' deep and my spot wasn't far from the landing. Just as I was expecting I got 1 whitefish at about 8:30pm and as the orange colored moon was just starting to peek above the horizon I got a fat 15.25" crappie that will join the other Crappies on my wall. icehawk, how far north might you head?????? i am planning to head up to the bowstring area the first weekend in April and would kind of like some idea what the ice is like and snow conditions. sure would like to dunk a few jigs yet!!!!!!! call geigers before you go. yea i'll call somebody, not sure i'd feel real comfortable calling them when i have no intention of going through there resort. i'll be alot further north then geigers!!!!! like maybe 8 miles!!!!!!! the way water is running every where I understand!!!! That sounds like theres a story behind it... and not a good one. bummer. but means the fish are safe for a while!!!!!! i'm hoping you just didnt drive far enough north!!!!!!!! chekcked 2 local spots. no go. yak might be on the water mid april. Ice is still a solid 20”+ in central MN. Shore lines are solid and the ice is still in shavings when drilling. I think yesterday was my last outing sadly got 9 big gills in 2.5 hours with a good bud. Consider yourself very lucky if you have intact shorelines. Royce is spot on shorelines around our area are long gone ice has lifted at least 3 foot or better. No way in Heck you will get on anything in this area safely. Buds were driving there Rangers on the ice up in park rapids over the weekend N is still pretty good and I assume you are N of us. Intersting. Smaller body of water I’d imagine? One we were on was a few hundred acres could have drove a truck on easy yet if you get through the slush and wet conditions.